Anderson Cooper (born as Anderson Hays Cooper in New York City, New York, United States) is a famous Journalist from USA, he is 51 years old and still alive, born June 3, 1967. Anderson Cooper is an American journalist living in New York. He is the son of Gloria Vanderbilt from her fourth marriage, who was with the author Wyatt Emory Cooper. 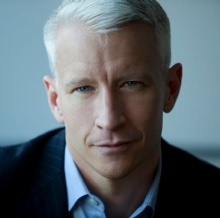 Anderson Cooper graduated from Yale University in 1989 with a BA in Political Science. He also studied Vietnamese in Hanoi. He has been a foreign reporter for Channel One, and covered Bosnia, Iran, Israel, Russia, Rwanda, Somalia, South Africa and Vietnam. He then moved to ABC. He now works for CNN, where he has his own program, Anderson Cooper 360 °, but he has also covered Hurricane Katrina in the United States, Baghdad during the elections in Iraq, the funeral of Pope John Paul II and the earthquake in Haiti in 2010. He also supplies materials to the program 60 Minutes on CBS. He is born under the zodiac gemini, who is known for Communication, Indecision, Inquisitive, Intelligent, Changeable. Our collection contains 13 quotes who is written / told by Anderson. "The world reacts very strangely to people they see on TV, and I can begin to understand how anchor monsters are made. If you're not careful, you can become used to being treated as though you're special and begin to expect it. For a reporter, that's the kiss of death"
"The whole celebrity culture thing - I'm fascinated by, and repelled by, and yet I end up knowing about it"
"That's the thing about suicide. Try as you might to remember how a person lived his life, you always end up thinking about how he ended it"
"If someone knows me and likes me or my work, they're more likely to allow me to tell their story. But it also cuts the other way"
"I've been addicted to TV since I emerged from the womb"
"I think you have to be yourself, and you have to be real and you have to admit what you don't know, and talk about what you do know, and talk about what you don't know as long as you say you don't know it"
"I think it's a good thing that there are bloggers out there watching very closely and holding people accountable. Everyone in the news should be able to hold up to that kind of scrutiny. I'm for as much transparency in the newsgathering process as possible"
"I suppose if you've never bitten your nails, there isn't any way to explain the habit. It's not enjoyable, really, but there is a certain satisfaction - pride in a job well done"
"I can begin to understand how anchor monsters are made. If you're not careful, you can become used to being treated as though you're special and begin to expect it"
"Anyone who says they're not afraid at the time of a hurricane is either a fool or a liar, or a little bit of both"
"Anyone who has experienced a certain amount of loss in their life has empathy for those who have experienced loss"
"A lot of compelling stories in the world aren't being told, and the fact that people don't know about them compounds the suffering"